The reproduction and representation as a private copy or for educational and research purposes (scientific papers) without any lucrative use. This, provided you always give credit to the Geopolymer Institute. The source must be clearly indicated in the same way as in your document (i.e. in the caption of a figure or image, a quotation reference for text). The scientific terminology must be used properly, for example: geopolymeric materials, geopolymeric binders, geopolymeric cements, poly(sialate), instead of the general terms such as inorganic, mineral polymer, alkali-activated, or any non standard new acronyms. Establishing of a hyper-link, without frame, to the home page or a category page, or a single page. Any other reproduction and representation of any part of this website without our written approval, even for non commercial purpose. You may not alter, transform, or build upon any part of this website. Any of these conditions can be waived if you get written permission from the Geopolymer Institute. It is sometimes very easy to get by writing a simple e-mail. If some people, institutions, companies or other groups are breaching this licence, infringing this website content, we will publish their names here in addition to a possible prosecution. 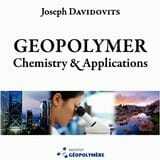 Joseph Davidovits put the word GEOPOLYMER (its english spelling) in the Public Domain. It means that everybody can freely use this word in scientific papers, for commercial or non-commercial purpose without any authorization. However, no-one can register this word alone in any country. The radical GEOPOLY® is a registered trademark filed on 21 august 1979 at INPI, Paris, France, ref. # 1 700 by Joseph Davidovits. Only valid in France. Record number: 1 105 493, classification: 1 and 19. The trademark Géopolymère® (the French spelling) is an international trademark registered on 15 march 1990 OMPI/WIPO, ref. # 548 387 by Joseph Davidovits, classification: 1, 17, 19, and 21. Origin France, 5 november 1986, 822 376 / 1 378 923. Most of the data collected through this website are processed in France except for third party services (Google Analytics) where it is difficult to know at our level.